An extraordinary strategy game involving an interesting planning mechanism. 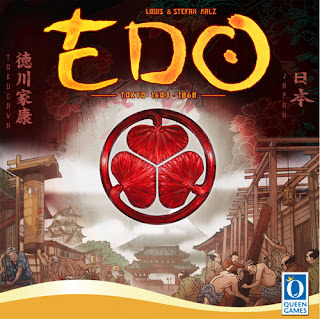 Edo is a worker placement and resource management game set in Japan in the years 1603 to 1868. Players use a unique planning system at the start of each turn. This involves secretly selecting three actions out of a possible twelve actions to perform and placing them on a player planning board. During this planning phase players assign their workers to each of their selected actions which will determine how many times they will be able to perform the actions. Each player starts the game with four workers (officials). Some of the possible actions include: ◙ allowing players to move a worker from their planning board to the main board as a Samurai; ◙ allowing players to obtain additional workers for their planning board. Some actions require the pairing of workers on a players’ planning board with Samurais on the game board before they can be performed. The primary function of a player’s workers and Samurais is to obtain necessary resources for construction of houses, trading posts, and fortresses, and for feeding their Samurais. Each building type requires a combination of resources and money to construct. Points are awarded for the construction of each type of building. Buildings can be constructed in any of the various cities including Edo. Each city yields different levels of income at the end of each round based on the number and type of buildings within that city. Points and resources can also be gained through trading with a roving merchant. The first player to gain 12 victory points through building and trading will be the winner. We have an open copy of Edo is available in our Store Demo Library for you come in and try out.